Woods Bagot has won a national design competition to create a dynamic mixed-use destination on the Gold Coast. 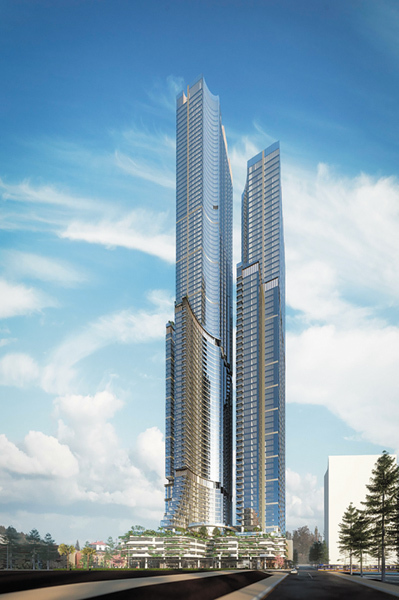 Introducing a new icon to the city’s skyline, a development application has been lodged with the Gold Coast City Council to build a slender dual tower form that is set to be one of, if not the tallest residential building in Australia. 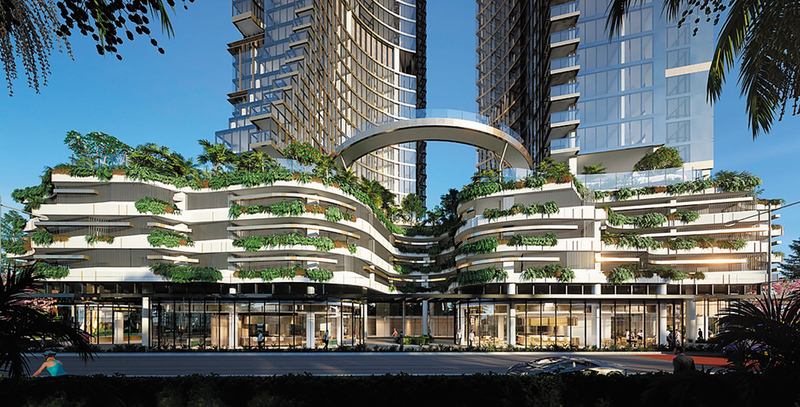 Put forward by Melbourne-based developer Orion International Group, the mixed-use project would feature two skyscrapers of 103 and 75 stories, respectively, and contain 1,127 units. The Southern Hemisphere’s tallest building is set to tower over Surfers Paradise at an astonishing 103 stories. The tallest of the proposed AUD$1.2 billion (USD$904 million) Orion Towers would reach up 328 meters and is planned for a Surfers Paradise Boulevard site between Enderley and Markwell Avenues. The ground plane will be punctuated by a dynamic urban village that will provide a sense of legibility and identity at the towers’ base. Low level awnings will define the street edges, grounding the monumental and civic scale of the towers and tower base respectively. The design features horizontal gold banding to streamline the facade as it rises into the sky, becoming graduated from the lower floors to emphasize the curvature of the form. The inward-facing tower facades have an articulated geometry that directs the view outwards, designed to increase privacy for residents while creating an aesthetic that offers a distinct design element to the structure. The towers are linked at the podium levels by a prominent and elevated curved bridge known as the ‘curious ring.’ The ring will reinforce the circular geometry of the towers and the form of the urban canyon. Featuring a large LED matrix screen on the underside of the bridge, the ring will display information such as time, weather and community event details. It is anticipated this modern interpretation of the town square clock tower will become a new meeting place for people to gather.